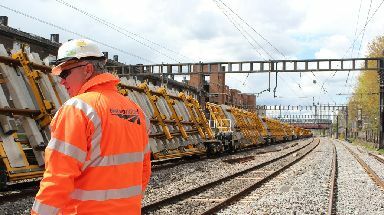 Rail passengers have been warned to expect major disruption on Easter weekend as engineering works get under way. Services in the north east and Glasgow areas will be affected by the projects, which are the first phase of a five-year plan to improve the rail network. Network Rail engineers will be replacing or refurbishing seven bridges between Aberdeen and Inverurie and improving drainage as part of plans to double-track the line between later this summer. Buses will replace trains on this route while the work is being carried out. Meanwhile, £4m of signals and points upgrades will be installed at Shawfield in South Lanarkshire, causing disruption to services to and from Glasgow Central. Engineers will be also working to renew tracks and a level crossing and to improve under-line drainage between Beattock and Abington, on the west coast main line in South Lanarkshire. Network Rail said this would lead to some services being reduced while others would be replaced by buses. The works will be carried out over three days, from Saturday April 20 to Monday April 22. Liam Sumpter, chief operating officer for Network Rail Scotland, said: "This investment programme is vital for the future of Scotland's railway. "It will help to improve reliability on the west coast main line - one of Europe's busiest rail routes - and prepare the way for a significant improvement in services for customers in the north east of the country. 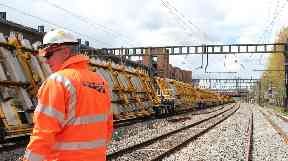 "The work we are undertaking this weekend will help to provide a more modern and more reliable railway. "We understand the inconvenience this work will cause some customers, but such a significant investment cannot be delivered without temporary disruption and every effort has been made to reduce the impact of our activities as much as possible."